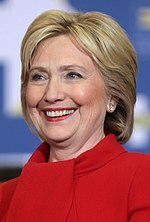 Hilaria Clinton, vulgo plene Hillary Diane Rodham Clinton (nata Sicagi die 26 Octobris 1947), alumna Collegii Wellesleiani et Scholae Iurum Yalensis, fuit Prima Domina CFA ab anno 1993 usque ad 2001, uxor Guilielmi Clinton, praesidis quadragesimi secundi. Ab anno 2001, senatrix fuit Factionis Democraticae Neo-Eboracensis. Die 20 Ianuarii 2007, Hilaria Clinton se Factionis Democraticae candidatam est professa populum ambituram, ut praesidis Civitatum Foederatarum munus anno 2008 consecuta in Domo Alba residere possit, sed a Baraco Hussein Obama profligata est, qui die 1 Decembris 2008 eam fore Ministram Rerum Externarum suae administrationis nuntiavit. Vicesima quinta inter feminas potentissimas orbis terrarum anno 2007 in actis hebdomadariis Forbes numerata est. Die 12 Aprilis 2015 Hilaria Clinton nuntiat se candidatam Civitatum Foederatarum Americae praesidis in electionibus anni 2016 fore, sed superata est a Donaldo Trump, quamquam ea plura suffragia hominum accepit. Morris, Roger. 1996. 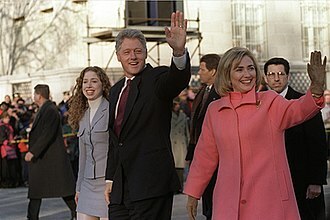 Partners In Power: the Clintons and their America. Novi Eboraci: Henry Holt. ISBN 0-8050-2804-8. Pilkington, Ed. 2015. "Hillary Clinton: running to win - but on her own terms." The Guardian, 14 Martii. Vicimedia Communia plura habent quae ad Hilariam Clinton spectant. Novissima mutatio die 19 Maii 2018 hora 08:03 facta.